What makes this marathon unique? The five boroughs, the iconic cityscape, the attractions, the people. 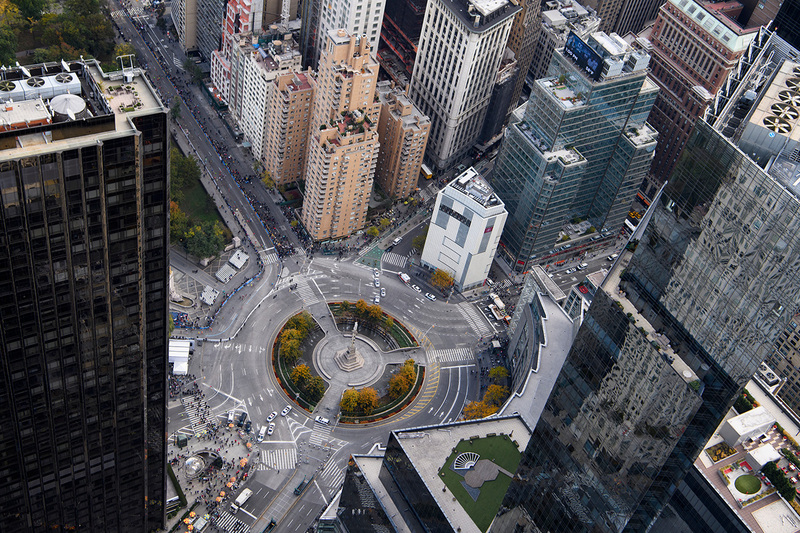 Take a tour of New York along with the runners -- from up in the air. 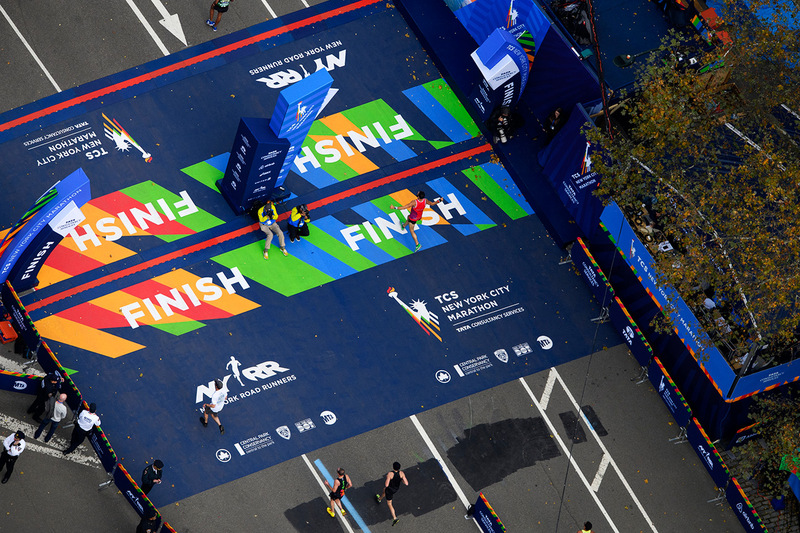 This Sunday, thousands of runners took to the streets to run the 46th (40th since it went to five boroughs) New York City Marathon. 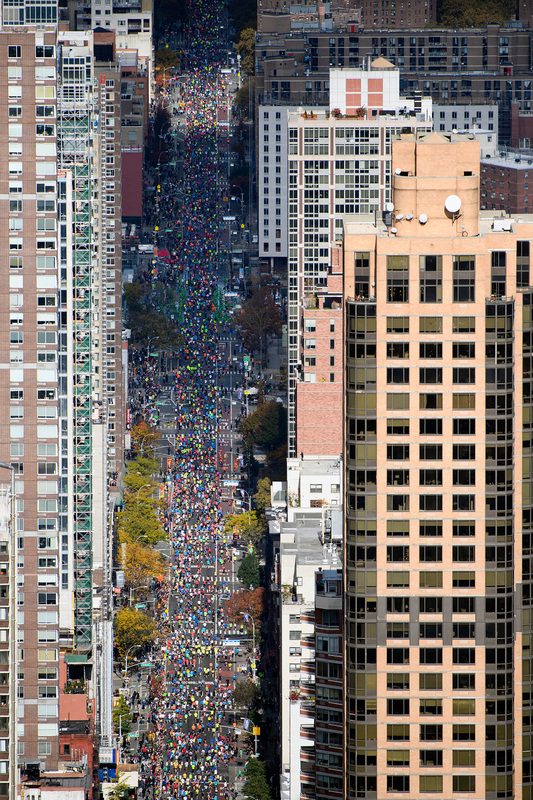 When the race left the confines of Central Park in 1976, founder Fred Lebow immediately recognized the event had forever changed, morphing from a mere competitive morning run in a park to a city-wide event that strung together various communities, even if it was initially set against a backdrop of high crime and financial ruin. Since then, runners from around the world -- be they Olympians or weekend warriors -- have flocked to the event, and a record 51,388 hit the streets Sunday. 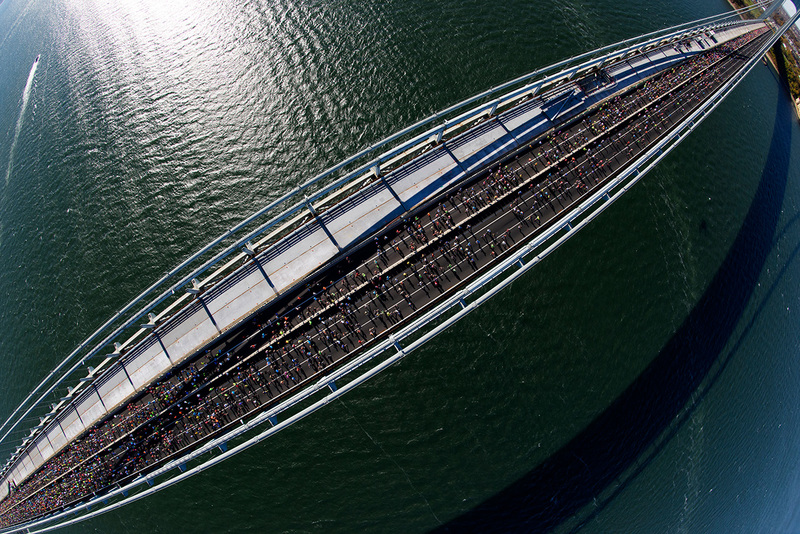 The logistics of getting that many runners ready to race are staggering: A year's worth of coordinating volunteers, security, bag drops, ferry and bus schedules. And that says nothing about the amount of coffee and carbohydrates consumed well before the start pistol is fired. While fans and runners are familiar with the scene on the ground, here's a look at the race from above. The start line is a hub where announcers pump runners up, with cinematic helicopters chopping overhead. 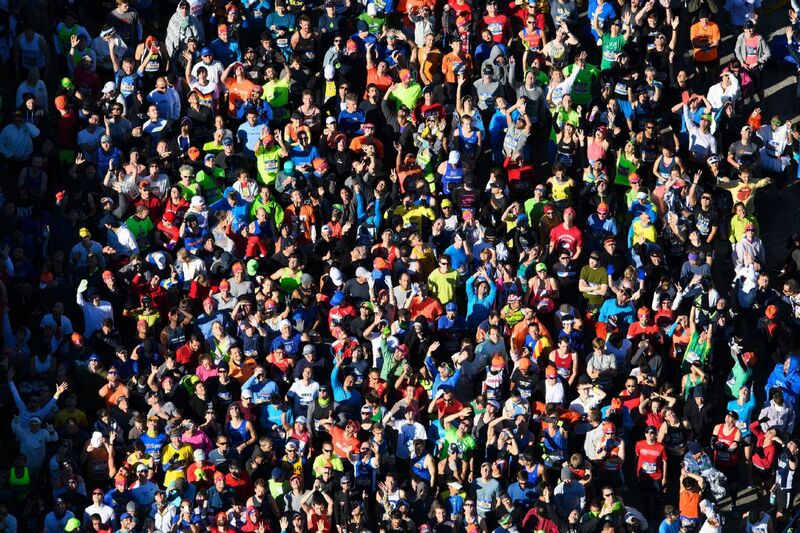 It's not uncommon for runners to strike up conversations with each other, a forced meeting of like-minded pacing partners, as they're stuck in corrals for what seems like an eternity. It's the most packed part of the race, and on colder years, a welcome, cozy fraternity. Others runners, however, are just eager to break out on their own and maintain stoic smiles. Fans of Robert Caro's "The Power Broker" know that the Verrazano-Narrows Bridge was among the last public works projects of Robert Moses, one of New York's most distinctive historical figures, but the bridge has long been tied to the first part of the race. The bridge is one of the most challenging chunks of race terrain. 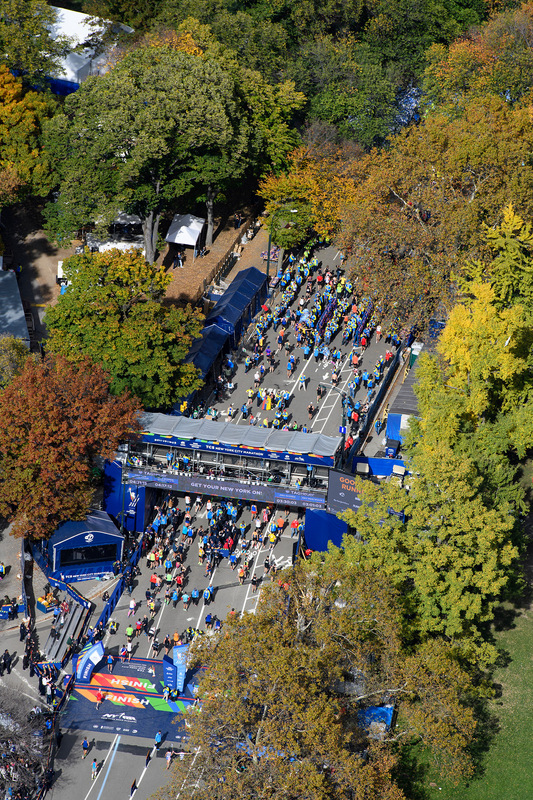 At its foot are throngs of portable bathrooms, coffee stations, and runners clad in extra layers, stretching out on the grass and pretending not to be nervous. The course barely graces Staten Island, but the Verrazano-Narrows is a preview of grit that will be needed later in the race. 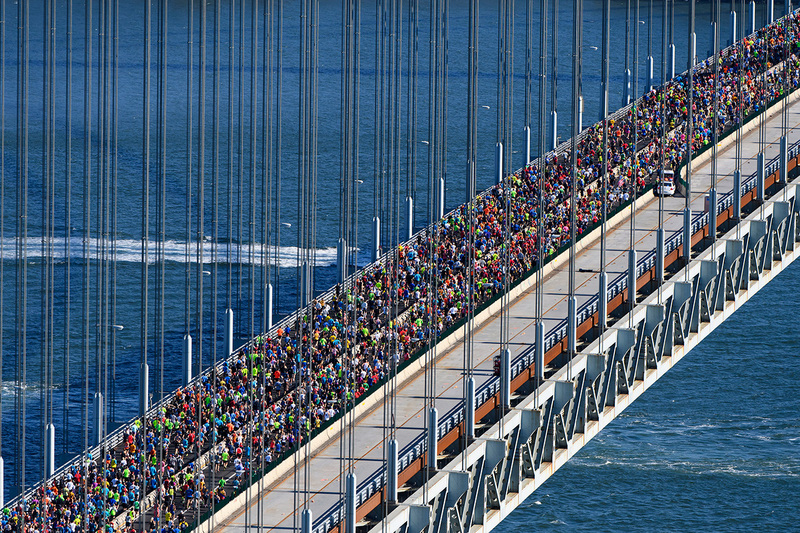 While named for the 16th-century Italian explorer Giovanni da Verrazzano (the bridge is actually spelled wrong with only one z), and inspiring in its massive towers and suspension cables, this is the part of the race where even the kindest runners may dismiss majesty and elbow each other to carve out space in the pack. After the solitude of leaving Staten Island, Fourth Avenue is the introduction to New York's neighborhood culture. 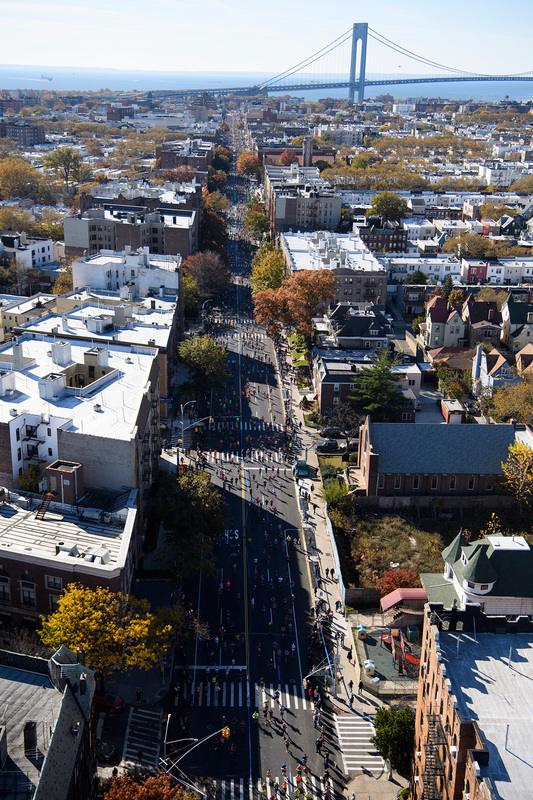 From Bay Ridge, where block parties and "Saturday Night Fever" references run high, the course shoots up Sunset Park and through cozy Park Slope, where family-friendly cheer stations adorn the course. By late morning, the roads leading up to Atlantic Avenue are packed, and many fan squads come armed with mimosas and encouraging posters. What many runners don't realize as they leave the Verrazano Bridge is that 35 UPS trucks are already in motion, schlepping participant bags from start to finish. At this point, many runners have shed layers of clothing, which will fill eight additional UPS trucks. Some make it a tradition to shed clothing they no simply longer want, garb from exes, old employers or other symbolic gestures of things that will be left behind as they take to the race. The pieces will then be donated to charity. 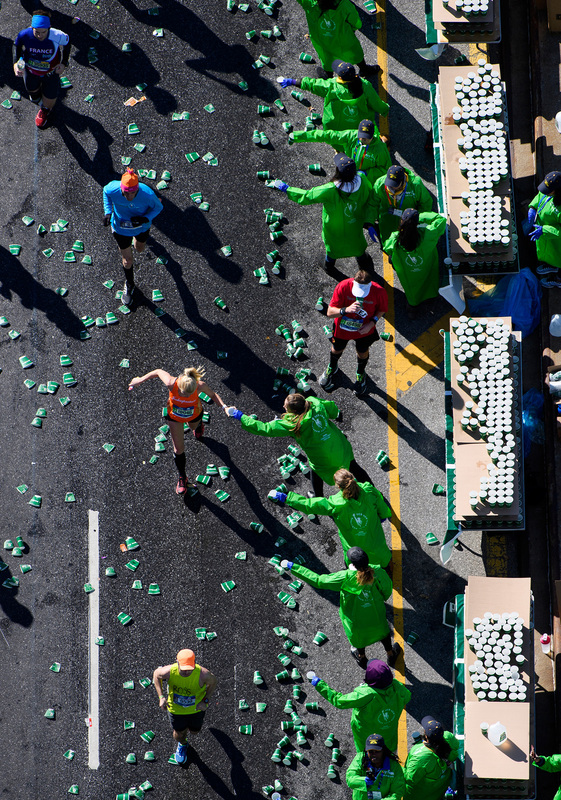 Staging the marathon involved the work of more than 160 full-time New York Road Runners staffers; 12,000 volunteers (10,000 of them on race day alone); 40,800 Power Bars; 60,000 8-ounce bottles and 1,200 16.9-ounce bottles of water; and 16,000 Gatorade Prime packets. Those numbers may seem staggering, but runners are going to need provisions for the epic course ahead. Fort Greene is traditionally where director and unofficial New York City mascot Spike Lee watches the race. (Lee served as the race's grand marshal in 2015.) 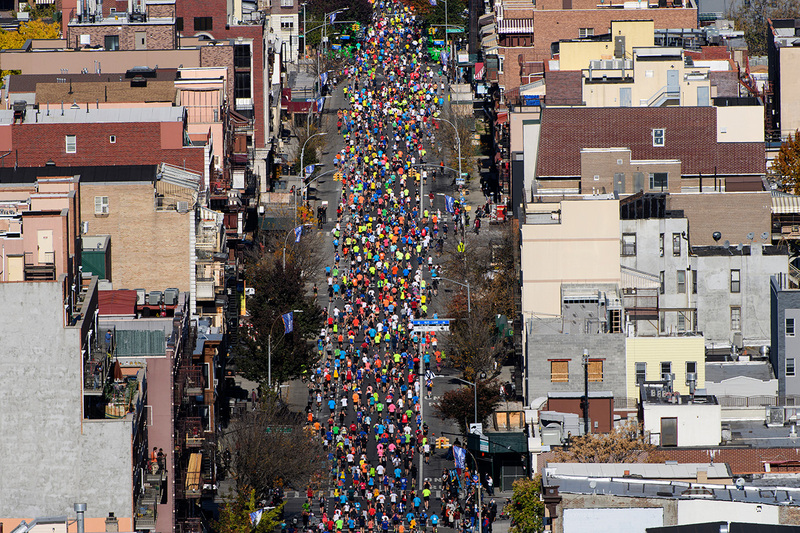 The Brooklyn Music School was stationed here this year, a fan-favorite of the 150 bands the New York Road Runners place along the course. 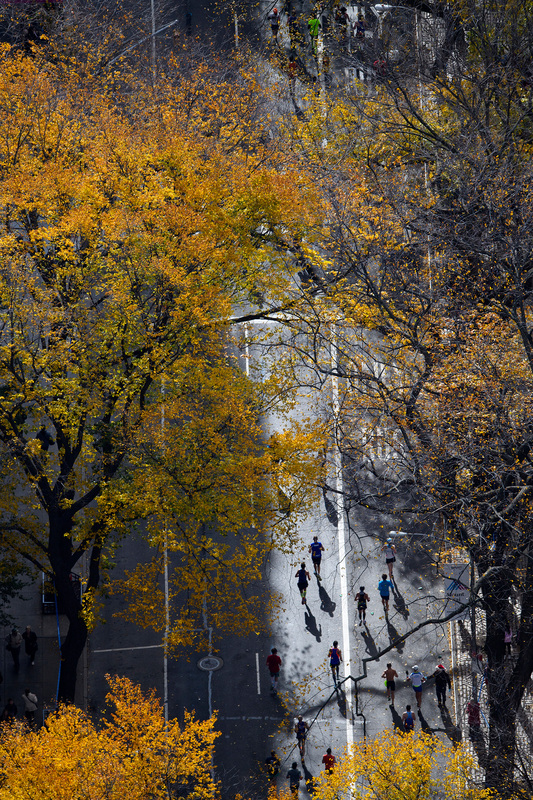 Runners at the front of the pack bemoan some of the twists and turns around here, but the canopy of trees can provide relief from the wind or heat. 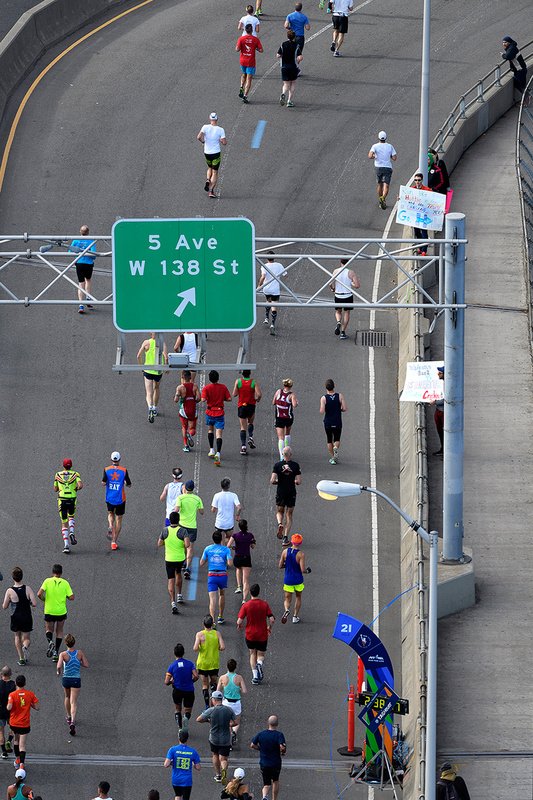 Fans are not permitted on the Queensboro Bridge, giving the passage a profound silence only punctuated by the cheers of other runners. In some ways, this is the most hopeless part of the course -- far enough in for the body to feel it and far enough from the finish line to feel despair. The wind can pick up here, but locals particularly relish the chance to run the bridge and barge into Manhattan without any car traffic. 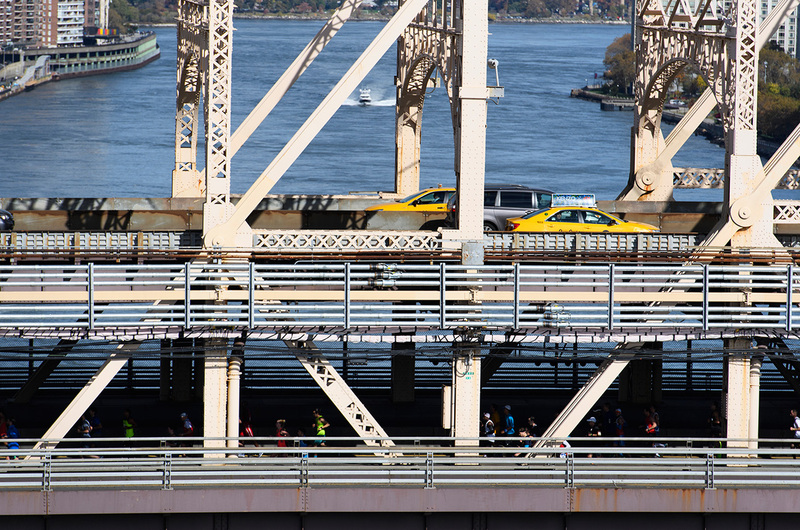 After the solitude of the Queensborough Bridge, runners gratefully enter a huge group of fans. The crowd is so encouraging, however, that many make the mistake of powering too hard down First Avenue, forgetting that the Bronx and the hook down Fifth Avenue remain. Marathon Day has long been one of the biggest Sundays for the bar business in the area. "Then it gets tough. When you get that uphill mile, the last 5K is really painful. At mile 22 you have all those people cheering. It's exciting, but the last 5K is hell." 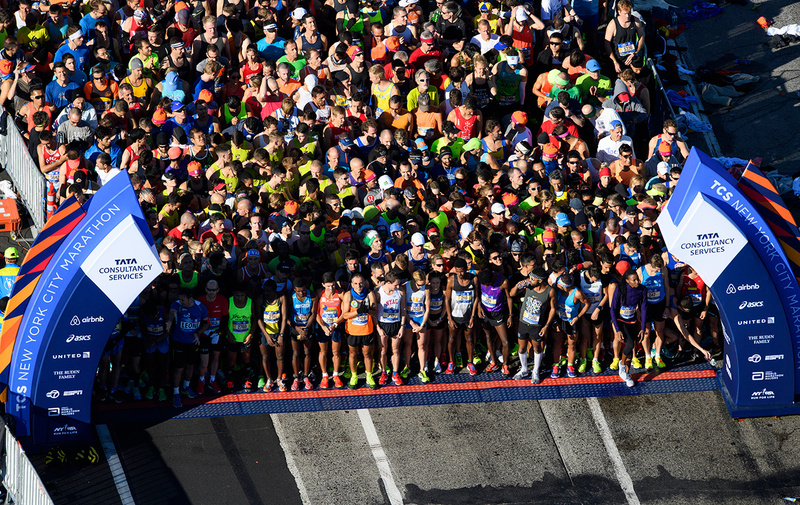 "The marathon barely touches the Bronx, and historically, it has been one of the most sparsely populated fan spots, but that's changing with fans and local musicians now staking out some of the most brutal stretches of the race. 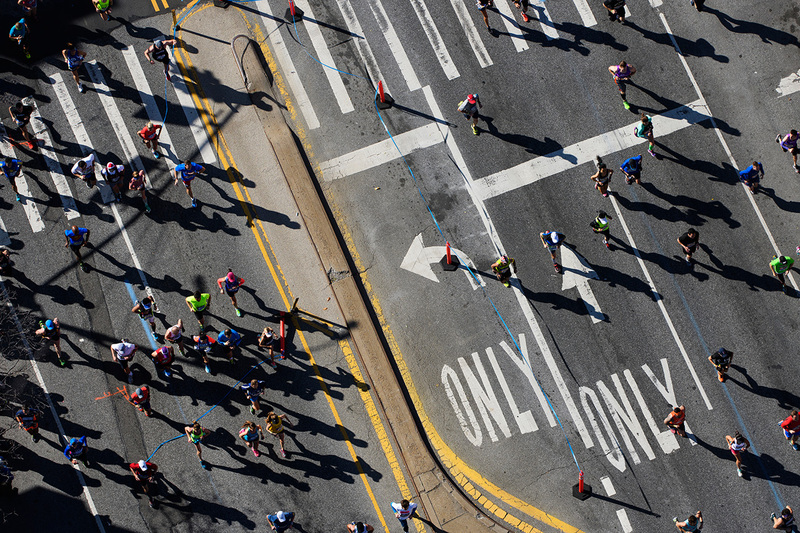 It's the mile when the race really begins for many runners, and is home to another New York Road Runners race, the Bronx 10-Mile, a popular run for local marathoners. There's no shortage of Yankee spirit on this leg of the course, either." 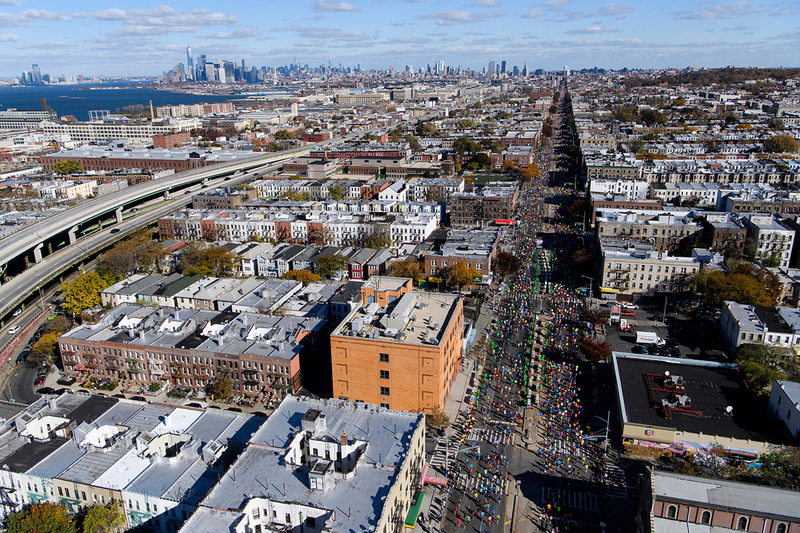 As the course barrels down from the Bronx back to Manhattan, the race really begins for runners -- and the crowd knows it. It's a favorite spot for cheering against the backdrop of some of the world's most stunning museums and murals. However, some of the hills in and around Central Park can throw even the most experienced runners. In one of distance running's more cruel acts, there's a slight incline on the very last piece of the marathon. Some sprint, some jog, some crawl, but at this point, runners know they're almost home. Fans know it, too -- the scene here is usually complete pandemonium adorned by Central Park foliage. After the Boston Marathon bombings, security at the finish line was heightened, and only ticketed fans are permitted in the grandstands. Still, much work has gone into retaining the finish line's history, including a statue of Fred Lebow that looks on nearby (usually covered in flowers, race bibs and sneakers on race day). Music blares, and announcers cheer on runners as they make their way across, but many participants are too tired to care about the details. Tears, high-fives, and collapses in the grass are all considered fair game beyond the 26.2-mile marker, and all those are expected. Friends and family must wait beyond the corralled finish area, making it a pen reserved chiefly for those who know blisters and shin splints first-hand. Volunteers offer bananas, water, blankets, smiles and hard-earned medals. And overheard is a question baffling to some: "So, what about next year?"